Packer has finally come around to having some work to get it up and running again. I'm hoping to have it ready for the Land Rover expo in a month. He is called Packer because he is a ute but Packer is an appropriate name with Pommy origins. English: occupational name for a wool-packer, from an agent derivative of Middle English pack(en) ?to pack?.German and Jewish (Ashkenazic): from an agent derivative of Middle Low German pak, German Pack ?package?, hence an occupational name for a wholesale trader, especially in the wool trade, one who sold goods in large packages rather than broken down into smaller quantities, or alternatively one who rode or drove pack animals to transport goods. Here is some history on Packer. Another SeriesII cab tray. Not a hint of rust in this thing anywhere!!! Holden 6 cylinder motor with a driveline that needs some service, but the body is sensational! 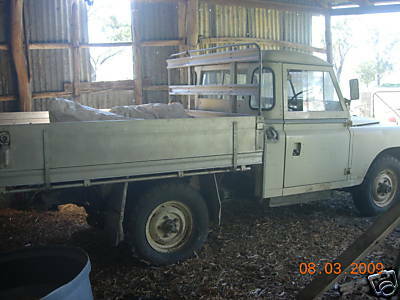 Here is a sneak peak at this stunning ebay barnyard find from Willow Tree NSW. Well, the good and bad news is that there was plenty of discussion about this ol' jigger on AULRO. It was one of the last Series IIa, including the 6cylinder motor etc. There were quite a few that were adamant about it not being carved up into a fun machine. Anyway, the long and short of it is that ol' Foxhound (Packer) is now destined to get fixed up. It wont be a restore job, but more a get it going and looking good project. Vehicle 34712523H, engine no 34524020B 6 Cyl Chassis Cab, Salisbury Axle, supplied 22.5.72 in a batch to the Grain Elevator Board, Registration No EIC129, fitted with Dunlop RTM (Road Track Major) tyres, keys 916 and 701. After picking Packer up he sat in the paddock for a while, but for what it was, the body wasn't in bad shape. 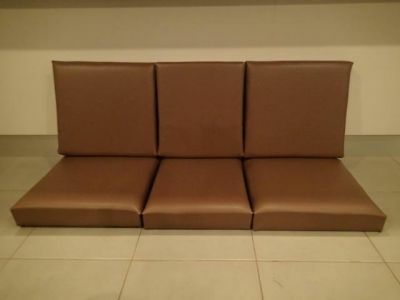 Found on Ebay at Willow Tree, the the owner said that she couldn't see any rust on it. I rolled the dice, placed a bid, won it for about $1k and towed it home. The gearbox was broken, I suspect the motor wasn't much good either and didn't even try starting it. The brakes and clutch didn't work and while sitting there the front PS axle seized also. It was a skull drag from there to the house. First up the tyres were beyond shot and needed replacing. I found some replacement rubber in Sydney. 6 rims were stripped, blasted and powder coated in Magnolia which was an almost identical colour match. New tubes and tyres went on and balanced without outward facing weights. The parts required for the bonnet mount were also found and a spare tyre mounted on the bonnet. Next job was to replace the axles. Rover front and Salisbury rear. This was to put some good serviceable units in that didn't require a total rebuild. The seats were a bit old and rat eaten from sitting in the previous owners shed for so long. Perhaps it all began when the vehicle was owned by the Grain Board. The timber and foam were replaced and then new vinyl pulled over the top of it. 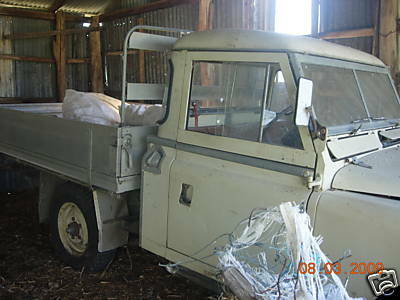 The Holden 202 engine and Land Rover gearbox needed to be replaced, so the floor, seat box, grill and bonnet were removed. The entire assembly was removed through the front. 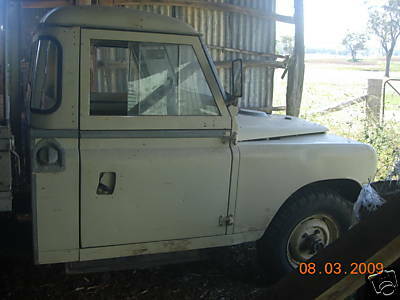 The replacement running gear is Holden 202 with the big Carby and Land Rover gearbox with an overdrive on the PTO. New exhaust to go with it too. All of the wires, hoses, linkages, shafts, exhaust etc etc etc are reinstalled and reconnected. Seat box and floors back in again. Like a man could ever have enough levers! Gear stick, 4WD lever, Range lever, Over drive lever and the handbrake! Transmission hump was drilled out for clearance for the overdrive lever. Superfluous holes were blanked off and seats were test fitted. Its the first time in years that I've actually sat in this thing! Clutch hose adapter hose made to couple a IIa master cylinder to a III slave cylinder. Lower hoses. Torana 202 lower hose part, coupling I machined from pipe and generic flexy hose. Transmission tunnel reinstalled, heater reinstalled and doors reinstalled. Interior is back together roughly.